This procedure involves placing the implant into the bone by parting the gum and exposing the bone. Once the implant is placed the gum is stitched together to cover the implant. This technique requires further surgery to expose the top of the implant once the implant has integrated into the bone. See item 691. This technique involves a tissue punch through the gum to expose the bone. 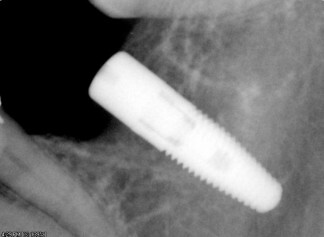 The implant is placed into the bone through the precisely made hole in the gum. A healing abutment is a cover over the implant, of various heights, to stop the gum growing over the implant. This allows the gum to heal into a defined shape around the neck of the future crown. Even a temporary crown can be placed to train the gum heal into a more natural shape. No stitches are required or further gum surgery is needed. Usually up to six months needs to pass before the permanent crown, bridge or denture is placed. This item also applies to mini-implants. 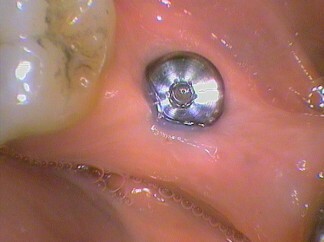 This is an implant that is designed to be removed later. They are often used to hold a denture while the long term implants integrate for a future bridge or multiple crowns. This is a temporary a device that holds a provisional appliance but is designed to be removed later on. It is attached to the implants. In item 684 the implant is placed and covered by gum. This item number is for the step to uncover the top of the implant. Normally there is a thin topped screw (cover screw) placed at the time of the initial placement of the implant to cover the opening of the implant. This is to prevent the gum and bone growing inside the implant. The cover screw is removed and a taller screw called a healing abutment screwed in. The gum is then stitched around the abutment. The healing abutment is now above the gum. Once this heals, usually a few weeks, the crown, bridge or denture can be made.